Seaplanes North is owned and operated by Jeff Walker and Stephen Routh who are both long time Alaskans, aviation enthusiasts and specialists. Both partners have a real love for the Alaskan experience and the practical Alaskan approach and simply love supporting and enjoying aviation. Stephen built the hangar and started the business in the late 90’s and has very broad business experience and capabilities not only with 185s and Cubs but with charter operations, helicopters and larger aircraft, not to mention real estate. Jeff joined in in 2000 as the operating manager adding in his 30 plus years of very focused general aviation experience. 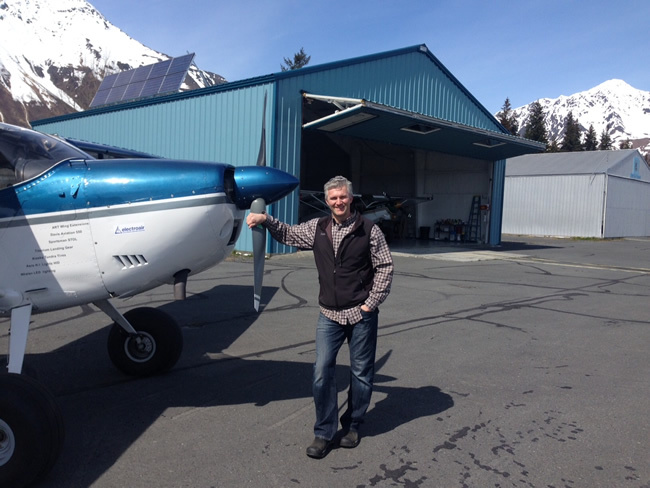 Jeff Holds A&P & IA ratings as well as Private Pilot certificate, an Embry Riddle Professional Aeronautics Bachelor’s degree, and most recently became an FAA maintenance DAR, which rounds out a very focused career with an utter immersion in Alaskan general aviation. The company has grown from just two people to an FBO employing 10-15 people Including four IA certified technicians. The initial services offered included float restoration, installation and secure storage for nearly 200 sets of floats, but with the formation of the LLC, the company very quickly became the foremost maintenance and modification center on Lake Hood as we have developed a large variety of other specialty services and distributorships. In 2004 the company acquired the assets of a neighboring Cessna Service Station. With that purchase, they branched out into sales of aircraft, aircraft parts and floats. The company also developed several supplemental type certificates (STC’s) and obtained a parts manufacturing authorization (PMA) from the FAA. With our very diverse services and products and FAA repair station certificate, we pride ourselves in high quality and relational customer service. Seaplanes North is very proudly the largest and most stable, sophisticated and diverse FBO ever to populate the shores of Lake Hood, and is looking forward to many years of service to the aviation community. Keith is our very reliable and experienced Director Maintenance. Everyone loves him for a reason and you will too. Gene, the parts department manager, is probably the finest light aircraft parts expert in the Northwest. He takes service seriously and has earned tremendous respect with his expertise. The entire crew is friendly, knowledgeable and hard-working and looking forward to serving you.